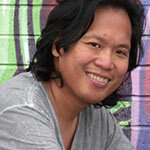 Gerry Manacsa is a designer, multimedia artist and technologist living in Jacksonville, Florida. As an engineer working on the Space Shuttle program in the early 90s, he was a pioneer in using the web as a medium for data dissemination and communication for geographically dispersed workgroups. He later broke ground in mixed-media storytelling in the early days of the web, anticipating the rise of blogs, photo sharing and social media nearly a decade later. The personal multimedia journal that was the canvas and playground for much of this work ran for over eleven years. As a lead designer and technologist with an innovative young Internet startup, he helped to create new learning methods that took full advantage of the medium, helping that company become a successful leader in its space. Gerry later joined another early-stage company, where he helped reshape the world of books for the digital era. Today, he works on wide-ranging projects, including data visualization and information design for web apps to improve kids’ learning in schools, interface design for mobile apps to help people with communication disabilities gain new independence, and visual design for a documentary film that aims to raise the level of political discourse. In his off hours, Gerry is a photographer and explorer, busy traveling the world with his wife, Karina, and their scruffy pups, Giles and Albert.